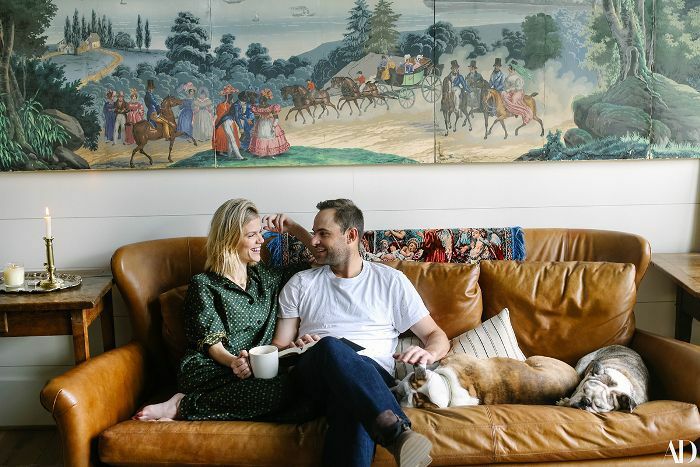 If you were wondering whether or not rustic décor could feel chic and modern, just take a look inside Brooklyn Decker and Andy Roddick's North Carolina home. The power couple recently opened their doors to Architectural Digest and we're so happy they did. The interior is a lesson in how to perfectly marry story-filled antique treasures with a modern sensibility. While the actress slash entrepreneur and former tennis player spend most of their time in their family home located in Austin, Texas, it's their North Carolina property that really makes a case for the modern, rustic design style. Thanks to Decker's own flair for interior design, the home is filled unique, one-of-a-kind pieces that even Roddick can get behind. "My taste has definitely changed by virtue of her being right often—now, I'm into these rustic, antique pieces that she finds," he tells AD. The seven-bedroom abode has a way of feeling cozy and warm, despite its impressive size (the home is situated on four acres of land, in case you were wondering). Although, that's no surprise considering its location and Decker's eye for the quirky. In the town of Cashier, North Carolina—not far from where Decker was raised—their neighborhood is no tourist trap. "It's a really tiny town with families from cities like Boston, Chicago, and Philadelphia," Decker explains to AD. "There's an interesting culture, too—like, ex-big city kids," she continues. From the moment you step inside the home, you're greeted with a stunning reclaimed wood A-frame ceiling and enough quaint details to keep you occupied for hours. Just note the built-in library lofted above the front entryway that surrounds a large window, the glamorous, circular chandelier that hangs above the sitting room, and the rustic ladder that leans against the wall leading up to the loft, for instance. The home boasts a design similar to that of a barn, something accented by the rustic wooden details throughout the home, many of which were made of reclaimed wood from the town itself. This was important to Decker, who wanted the structure to fit with its surroundings, AD explains. The final look certainly feels appropriate for the home's location. It's practically one with its natural surroundings. "We were trying to bring in the open sky and the green mountains in the best way I know how," Decker shares. "The view from this room out to the mountain is really beautiful. The fog rolls in every day and it never looks the same,” the actress continues. Aside from the build, Decker was highly involved in the smaller details of the design process. She calls out 1stdibs and other local antique outposts as the sources for much of the décor found in the house, all of which fall into a color scheme of natural browns and complementary blues and greens. “I like darker, more colorful colors," Decker says. A combination of white walls, leather chairs, and reclaimed wood beams create a distinctly natural feel in the rustic mountain home as shown above. You'll note that this dining area has ample seating, likely because Decker and Roddick both had entertaining guests in mind when designing the space. In fact, they hosted their first Christmas in the home last year. "Nothing is precious. Come, relax on the furniture, have a glass of wine, stay forever—that’s the space we wanted to create," Decker says. Curious to see what the rest of this dreamy, secluded home looks like? Head to Architectural Digest for the full tour.